The Indian Ocean is unique among the three tropical ocean basins in that it is blocked at 25°N by the Asian landmass. Seasonal heating and cooling of the land sets the stage for dramatic monsoon wind reversals, strong ocean–atmosphere interactions, and intense seasonal rains over the Indian subcontinent, Southeast Asia, East Africa, and Australia. Recurrence of these monsoon rains is critical to agricultural production that supports a third of the world's population. The Indian Ocean also remotely influences the evolution of El Niño–Southern Oscillation (ENSO), the North Atlantic Oscillation (NAO), North American weather, and hurricane activity. Despite its importance in the regional and global climate system though, the Indian Ocean is the most poorly observed and least well understood of the three tropical oceans. 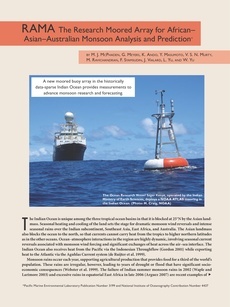 This article describes the Research Moored Array for African–Asian–Australian Monsoon Analysis and Prediction (RAMA), a new observational network designed to address outstanding scientific questions related to Indian Ocean variability and the monsoons. RAMA is a multinationally supported element of the Indian Ocean Observing System (IndOOS), a combination of complementary satellite and in situ measurement platforms for climate research and forecasting. The article discusses the scientific rationale, design criteria, and implementation of the array. Initial RAMA data are presented to illustrate how they contribute to improved documentation and understanding of phenomena in the region. Applications of the data for societal benefit are also described.